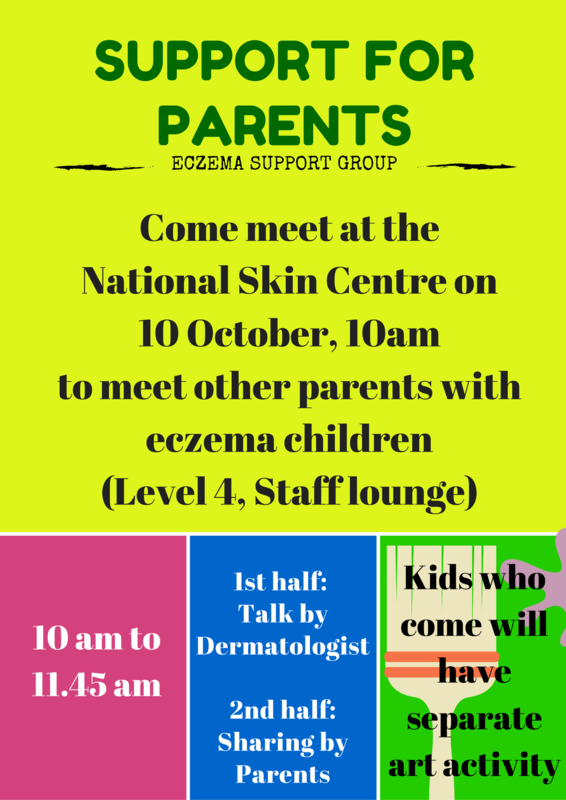 This October, the Eczema Support Group will hold the first session, just for parents. We aim to bring parents who are facing similar issues together, to share about their experiences and learn effective coping methods. October 10, Saturday10am session will have a dermatologist to share with the parents and the support group sharing by parents will be facilitated by a medical social worker from National Skin Centre. Light refreshments will be provided and for parents who bring their children, the children will have art activity in a separate room on the same floor. Do RSVP (email [email protected]) so that we can prepare the refreshment and art materials. We love to hear from you and your response will help determine future support group’s session, see you! eczema is so common these days. this is very useful! thanks! Elderly have eczema too, with their dry and thin skin, more in this series on Elderly Skin Conditions! See that your centre is caring for the elderly, care for their skin too!